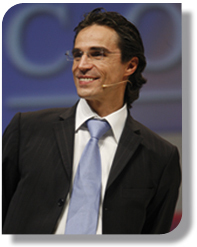 Paolo Ruggeri delivers high impact speeches to companies and groups throughout Europe. Paolo is fluent in English, Spanish, and Italian. When you book Paolo Ruggeri for a speech you aren't just bringing the umpteenth expert or consultant into your company. Every one of his speeches is based on research of global context and provides down to earth practical advice that people can immediately USE to turn their situation around. People come out of his speeches inspired and ready to roll. -Effective Management for Small and Mid-size enterprise. All speeches are tailored to the needs of the customer. Speeches normally range from a 1,5 hour speech at a convention, to a full day seminar on the topics listed above.